• From this point start adding in 30 second increments until you get the desired look. No you have not. Just fire your designs using a 1/8" thick fiber shelf and 1/32" fiber sheet and you will be find. In fact, in most cases the bottom of the shelf will turn back white. I have just purchased my second Microkiln (this time a medium size) as I thought I had ruined my first one by sanding a few burn marks off the bottom. After that the shelf paper kept burning. However after trying my new kiln today I am having problems with the shelf paper burning still. This happens after warming the kiln on 400 w for about 4 minutes. I thought it might be the microwave so I tried another one but got the same result. The shelf paper I am using is Bullseye thinfire which I used before with really good results. I really cannot understsnd why I am unable to heat the kiln without the shelf paper burning miles before the glass shows any sign of melting. I am absolutely flumaxed and would appreciate any suggestions. Jannie, not to worry. You are not doing anything wrong and there is nothing wrong with your kiln or fiber paper. Fiber paper contains a sugar binder that must burn away which causes the paper to turn a burnt black and then back to white again. Many times in a large glass kiln and especially if you peek just at the right time you can actually see it catching on fire and even flaming. So everything is okay, you may need to length your fuse time or if you peek sooner like you did just close the door and extend the time in 30 second increments until your glass has fused - don't worry about the fiber paper at all you are using the best kind. In the meantime, keep track of the total number of minutes/seconds it took to fuse your piece and use that total number of minutes/seconds the next time you fire a design of the same thickness, size and glass type. I hope this helps, please keep me informed. Marti, sorry it has taken me so long to respond and I hope the explanations of the photos above prove beneficial. 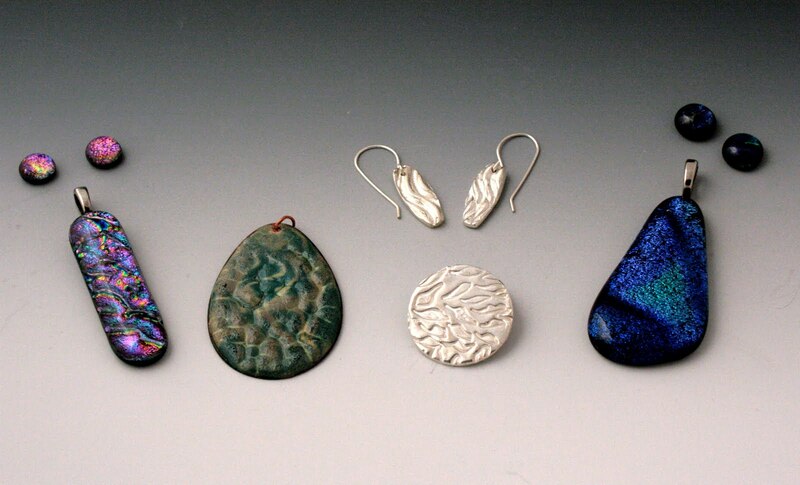 If you want to fire a metal finding between the glass you need to choose fine silver, copper or high fire temp wire. I do not recommend firing sterling because it will turn black and create a lot of firescale. Hello there. YES you can fire metal in the microwave kiln, in fact I fire and sinter PMC, Art Clay Silver, fine silver and copper wire between my glass all the time; however I don't recommend firing sterling because it will form firescale and unless you don't mine cleaning up fire scale. If you do fuse using sterling or copper, just make sure your top pieces of glass is not transparent so the black firescale will not mare the look of your design. This also goes true for copper but not as bad. If you want to fire metal bails between glass, I recommend using fine silver strip, cutting it to length and using a pair of round nose jewelry pliers to turn the bail end - it works great and looks very professional. I hope this helps. "Sam"
I just had a piece of glass fall off the paper in my fuse works microwave kiln. It has melted onto the exposed part of the kiln base. If I can get it off is there a way to salvage the kiln base? Or do I need to buy a new kiln base? Yes you can salvage it by scrapping off the damaged portion and either using a durable fiber shelf to cover and fire with or purchase the MicroKiln Repair & Recharge kit which will repair both the top and bottom portions of the kiln. I sell the product on my homepage @ www.designsbysylvanye.com. Is the MK capable of firing terracotta clay? or does it not get hot enough. Jon, I fire high fire ceramic clay and it works great for that. Not sure of if Terracotta fires hotter. If not, it should work. You are not leaving your glass it in the kiln long enough. The binder burns out of the fiber paper thus causing it to turn brown and then it turns back white again. I hope this helps otherwise, please contact me again. There is a sugar binder in the fiber paper that keeps it together as a solid sheet until fired. The brown you see is the binder burning away and once it is completely gone the fiber paper will turn back white and the fusing of the glass generally begins - in other words you are not letting the glass fire long enough. If you have any other concerns, please feel free to contact me via my email address @ mkhdblog@gmail.com. Also Sam I forgot, is it important to use the fibre kiln shelf, am I right in saying that is the thicker felt stuff that goes under the fibre paper? You are right but it is only 1/8" thick and can be used several times before having to throw it away. Is there a product for just repairing the base of a mcrowave kiln? Yes, Jennifer their is and it is called, Microwave Kiln Repair & Recharge kit which repairs the top and bottom of the kilns. However, there are two other options. 1) You can take some sandpaper and stand down and level the hole with the platform base or like I do 2) Fill the hole in with some ⅛" fiber paper then use a piece of the same as a shelf and afterward lay your fiber paper on top of this. Hope this helps --- Sorry I am just seeing the info request for the first time on my system; don't know what happened. Hi here. My first try at fusing glass was a disaster. I am using the large Fuseworks kiln. I must have fired it too long because it caught fire and disintegrated. Now the interior is coated with a white film. Am I a kiln killer? What can I do to save the kiln? Can I repaint the interior with graphite? HELP! Joan, all is not lost but I am a little confused by your statements and clarification would really help me certain the best method for helping you repair your kiln. "it caught fire" - what caught fire; the glass, fiber paper, etc.????????? "disintegrated" - the glass, fiber paper, etc.???????? What speed or temp were you using? Is the white base of your kiln in tact? Please send me a pic of the inside of your kiln to: mkhdblog@gmail.com and I will respond once I receive your answers and pic. Not to worry, you did not kill your kiln........ "Sam"
I am trying to use small slumping molds in the microwave kiln but the glass always cracks. Any suggestions? 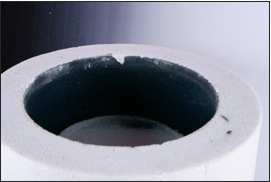 What type of mold are you using, ceramic or stainless steel? What the of release are you using? When does it crack - while still in the mold or after it comes out. Yes it is. You can fire it just like you would in a conventional glass kiln and as far as that goes you can also fire metal like copper between glass to create a bail as well as metal clays. Hope the information provided helps. Checkout and join the Facebook Group, Microwave Kiln Glass Fanatics and there you will find additional information regarding microwave kilns, metals, molds, etc. that are used and much more; just do a search. Also LIKE my Facebook page, Designs by Sylvanye Glass Teaching Studio and their I talk about the MWK and also offer giveaways. I suppose the glass got too hot because my kiln started making popping noises after I took it out of the microwave and when I looked it had turned into a big brown blob and part of it got onto the kiln base. I tried using a knife to scrape off the glass and it got most but not all. Also, now the base is just slightly bumpy. Will glass residue and a slightly bumpy base affect future projects? First, don't take your MWK out of the microwave until it has cool down. You can crack the microwave door open to speed up the cooling. The popping is coming from the inside of the kiln getting too cool to fast and can even cause the side walls to crack - this even happens with conventional glass and ceramic kilns. Not sure what turned into a brown blob - was it the fiber paper and glass or just the glass. You can still use your base by either filling in the cracks with my repair and recharge kit for MWKs or use sanding paper to level out the hole with the base and starting again or as I do; fill in the cleanup hole with some ⅛" fiber paper then use same as a shelf over the hole followed by your regular 1/32" fiber paper. Please let me know if this info helps you. Hello Phyllis, unfortunately you have to use the graphite & binder repair & recharge kit to repair the damage. If it were the bottom/base of the kiln I could help you correcting the problem without having to purchase the repair & recharge formulated white paste for it. In the meantime, you will need to gently pluck the glass off and fill in the gaps with the graphite/binder kit. My company is the only one I know of that offers this kit which can be found on my website @ www.designsbysylvanye.com/id66.html. Although it is not shown separately, I am now offering the repair & recharge kit for repairing cracks and holes in the hood without having to purchase the base for only $40 plus $8.75 if you reside in the US otherwise I will have to quote you a corrected shipping charge. Since it is not listed as yet on my website you can either purchase it using your credit card directly rather than through Paypal or send payment to my Paypal account @ Slroh2001@gmail.com. If purchased I will send you a confirmation along with a copy of the invoice and instructions on use. The kit would be mailed out via USPS Priority Mail the very next day. If you would like to discuss further, you can call us at 615-397-6406 and ask for Sylvanye nickname "Sam"
Love your informative site. Are you saying there should be 2 pieces of micro paper beneath the glass? I have been putting down just one single sheet of kiln paper. It leaves more of a pattern on back side of piece than I expected.I'm new to this but very excited about the whole process! Your blog has given me the most information. Thank you Sam for taking the time to help us 'newbies' out!! Hello there. First I recommend that you purchase a piece of ⅛" thick fiber paper to use as a shelf; then atop that place your regular fiber paper. Your MWK base needs to be protected just like in a conventional glass kiln. It protects your base from any mishaps. Let me know if I can be of further help. Have a great holiday and bring the New Year in with a BANG! Can I put mirror glass in my microwave kiln?